Blood contains haemaglobin that absorbs the light and converts it into heat. This heat destroys the protien in the wall of the thread vein. 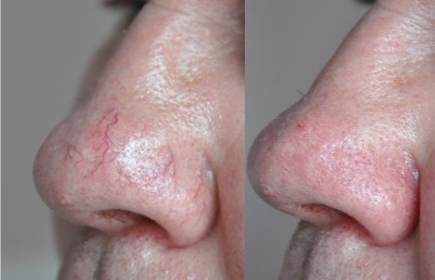 As a result the veins will gradually, and safely, disappear after treatment. Tolerance of pain is very individual from person to person. No anaesthetic is required, and most people describe the sensation as similar to that of an elastic bandsnapping onto the skin, followed by a warm sensation lasting several minutes. The number of treatments depends on thebody site and the severity of the thread vein. Usually 1-4 treatments are required, and these are timed about one month apart.